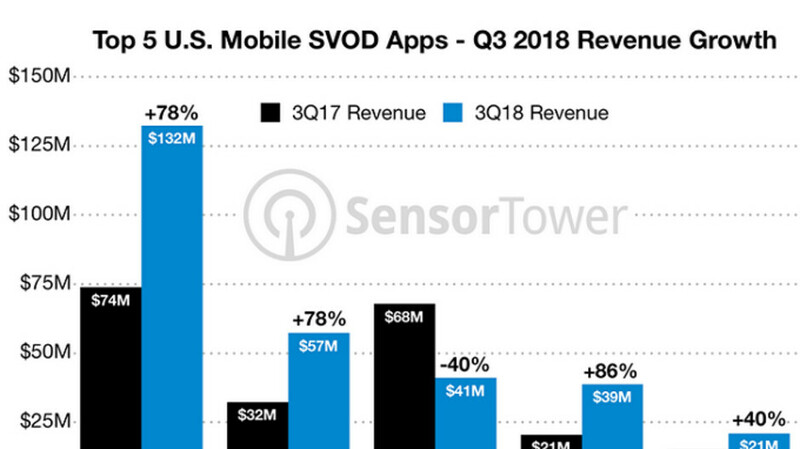 Data released on Tuesday by mobile app analysis firm Sensor Tower indicates that U.S. consumers spent $329 million last quarter to subscribe to the top ten most profitable subscription video on demand (SVOD) mobile apps. The apps, which are available in both the Apple App Store and Google Play Store, include such well known names as Netflix and Hulu. The $329 million spent on these SVOD apps was a 43% increase year-over-year. As a comparison, overall app revenue rung up by the iOS and Android app stores was up 28% during the July-September period. The top five apps by revenue did not change from the third quarter of 2017, although there was some change in the rankings. At the top of the list was Netflix, which brought in $132 million in revenue during the third quarter. That was a 78% gain from the $74 million that came in during last year's Q3. YouTube also saw year-over-year growth of 78% during the quarter, as it moved into second place with revenue of $57 million. A delay in the release of the final season of Game of Thrones was cited by Sensor Tower as one of the reasons why HBO Now suffered a huge 40% decline in revenue from Q3 of 2017 to this year's third quarter. The eighth and final season of the highly popular show will not be available until early next year. The decline knocked the app's third quarter revenue from $68 million last year to $41 million this year. Hulu had the fourth highest revenue in the U.S. for subscription video apps during the third quarter, and its 86% growth rate was the highest among the top five. That growth took the streamer's top line figure to $39 million from the $21 million it rang up last year. And in fifth place was Starz, with revenue of $21 million, up 40% from the $15 million the app collected in the third quarter of 2017. 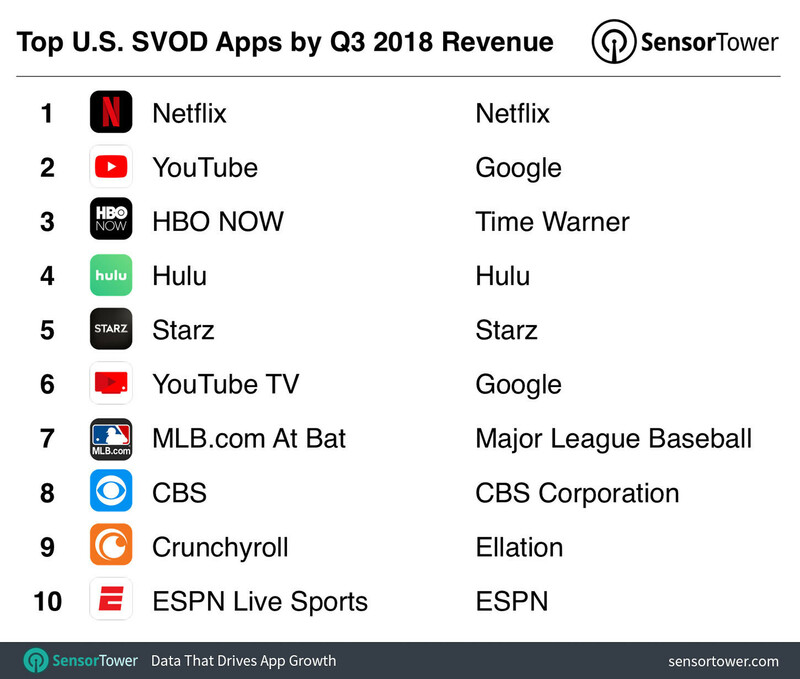 The remaining five SVODs in the top ten during the period include YouTube TV (number 6), MLB.com At Bat (7), CBS (8), Crunchyroll (9), and ESPN Live Sports (10). YouTube TV scored huge growth during the third quarter as revenue grew from $3 million last year to $16 million this year. All of this is based on subscriptions purchased for iOS users since the app is not monetized on the Google Play Store. ESPN Live Sports also had an outstanding third quarter, as its revenue increased by 117% from last year. Because cable and dish TV are overrated, overpriced. 300 channels with 50% being HD versions of the same channel. All the movies you want to see, you can just pay and stream. I'm never paying for cable ever again. All I watch is CW and Fox for Empire. The rest of TV and cable is garbage. And 99% of revenue comes from iphone users. I'm surprised that Amazon Prime Video isn't up there. I'm not as surprised, as I think the number of people who pay for Prime Video on its own (i.e. they aren't subscribed to Prime) is probably on the small side in comparison to the ones on this list. I guess they aren't counting it because its just a perk of having Amazon Prime in general and not so much an SVOD. Makes sense. I start and stop HBO Now for when the shows I watch on it are showing. Hulu is nice but I don't use it much, I just have it because it's bundled with the Spotify student subscription. I think it's cool that AtBat is the top sport app here.